Ranging Far | A Ranger blogging about nature conservation, wildlife, and travel. The Countryside Management Association held a Tree Identification training day on Friday last week. Taking place at Westley Heights in Langdon Hills Country Park (near Basildon, Essex), the training focussed on the tricky part of tree ID, identifying trees in Winter: bark, buds and tree shapes! We started off indoors with tea, coffee and cake. The trainer, Phil, explored how buds, bark and tree shape can all be used when identifying trees in Winter when most of them lack leaves. Next we headed outside to practise our identification skills on some real live trees, taking a walk through some of the varied habitats found at Langdon Hills Country Park. Learning tree shapes to assist with Winter tree identification! Calling all rangers, wardens, conservation volunteers, countryside students…. and any other countryside and greenspace people! The Countryside Management Association are holding an East of England “Ranger Rendezvous” in Basildon, Essex. Friday 01 March 2019, 4pm til 7pm. Come for a walk and meet other people in the sector. CMA members can just book themselves on, non-members please ask to be added to the event. Visit the event at Eventbrite for more info and tickets! This will be a chance for staff, volunteers and students in the greenspace and countryside sector to get together, meet others in the field and share ideas. We’ll start with a walk (4pm) at Langdon Hills Country Park, a beautiful park managed by Thurrock Council. We’ll follow up with some networking and discussion indoors (5pm-7pm). Please feel free to join is for any or all parts of the Ranger Rendezvous! “Langdon Hills Country Park sits on a hilly ridge that extends from Dunton to Vange. Its 400 acres have panoramic views over the Thames Estuary and across to London” – Thurrock Council. The park has a wide variety of habitats and links up with neighbouring Langdon Nature Reserve (managed by Essex Wildlife Trust) to form a brilliant belt of greenspace on the edge of Basildon and Thurrock. It’s an interesting site, with veteran trees (I filmed by Biodiversity Ambassador video here), ethical beehives, annual World Ranger Day events and an active Friends group. The Country Park is also hosting a Tree ID day run by the Countryside Management Association, taking place earlier in the day on Friday 1st March. If you haven’t been to Langdon Hills Country Park before, why not join us for the Tree ID course or the Ranger Rendezvous? Or both! The Countryside Management Association supports the development of staff, students and volunteers involved in the management, interpretation, and public enjoyment of natural greenspace and the countryside through networking, training and continuing professional development. Formed in 1966 the CMA is the largest organisation supporting the work of conservation, access and recreation professionals in the natural greenspace and countryside sector throughout England, Wales and Northern Ireland. To find out more about the CMA visit http://countrysidemanagement.org.uk. As we decorate our trees in the run-up to Christmas, you might wonder where the tradition of Christmas trees comes from? Queen Victoria and Prince Albert in 1840s with their German style Christmas Tree. Although we decorated homes and churches with greenery in the UK, bringing a whole tree into the home and decorating it was unknown until two centuries ago. Our modern Christmas tree tradition came to the UK from Germany, and many think of Queen Victoria and her German husband Prince Albert who made a lot of today’s Christmas traditions popular. It iss thought that the tradition was first introduced even earlier by King George III’s German wife in the 1790s although it didn’t spread beyond the royal family. “The old Celtic custom of tying cloth dipped in water from a holy well to a ‘clootie tree’ echoes the practice in Japan of decorating trees with strips of white paper, or tanzaku, bearing wishes and poems.” Common Ground, Tree Dressing Day. Common Ground “planted a seed” in 1990 by going back to the idea of decorating living trees out in the landscape, encouraging communities to remember how much trees do for us. Perhaps a bit kinder to trees than cutting one down to bring indoors and decorate! Tree Dressing Day falls on the first weekend of December each year, and has grown to include many different communities celebrating trees in their own way. A couple in Worcestershire had a live Christmas tree, a small fir tree, and they decided to plant it outside their house after Christmas. “I remember after that first Christmas thinking to myself that I didn’t want to just throw the tree out so I planted it in the front garden,” says Avril Rowland. That was in 1978, and now Avril and her husband Christopher have a 52ft Christmas tree that lights up their whole street! “London’s Shard gets some festive sparkle” – the top 20 floors will be lit up in a display every night from 3rd December through to 1st Jan to celebrate Christmas. A bit like a really tall Christmas tree. Today I’m going to tell you about a fantastic day out I had last week, spent exploring London by boat (City Cruises) with my lady love. It started off in February, with a present for Natasha. A combo London package with a shard experience and sightseeing River Thames cruise. The shard trip was excellent, but we got diverted by a free walking tour, lunch and more. Time ran away from us so we postponed the boat trip for another day. Flash forward to November 24th. Cold, grey but blessedly dry, Saturday dawned on us. We had the usual rush to escape the house at a decent hour, but finally we were London-bound on a C2C train. I browsed the Internet for sightseeing ideas that would match up with stops on the cruise – Tower, Greenwich, London Eye, Westminster. In the end it was a combination of last-minute research and luck that pulled it all together into a top day out. City Cruises sightseeing stops: Westminster, London Eye, Tower, Greenwich. A short walk from Fenchurch Street (French Urchin Street according to some autocorrect functions) brought us to the “Tower” pier, aptly named as it sits beside the Tower of London. City Cruises boats depart every 40 minutes, and the hop-on, hop-off 24, hour river pass lets you cruise up and down the Thames all day. We collected our tickets and boarded the next boat (the “Millenium of Peace”) heading down-river, destination Greenwich. We watched the banks and buildings flow by from the open-topped upper deck. What made this boat ride particularly memorable was the live comic commentary from a crewmember – although not a professional tour guide, he was an excellent and amusing accompaniment to our cruise along the Thames. Topics ranged from pirates to Cher to drinking spots along the river. Docking by the Cutty Sark in Greenwich, we briefly browsed the Old Royal Naval College museum but found ourselves famished. We headed out in search of victuals and found our food at the Buffalo restaurant. On to the nearby Greenwich Market, “London’s only historic market set within a World Heritage site” (greenwichmarket.london) and a quaint and quirky collection of stalls. The market was feeling festive, decked out with lights and a number of Christmas-themed wares for purchase. We bought a few small, unique, hand-made Christmas presents and finished off with an Amaretto-flavoured coffee to keep warm. We had a bit more time before the next boat heading to Westminster, so we checked out the Greenwich Foot Tunnel – 100 steps down and then back up to satisfy my curiosity about this tunnel beneath the Thames, thanks Natasha! We explored the Old Royal Naval College a bit further too, cue photo of the Lion statue. Then we boarded a boat heading upriver. This time we sat pretty for the cruise. This boat had a spacious indoor area on the lower deck with many large glass windows, allowing us to shelter from the cold with great views of the capital: darkening with dusk and gradually glimmering with lights. We travelled beneath the Tower Bridge, cruised past the London Eye and alighted at Westminster pier. ‎A stroll along the night-time river brought us to the Tattershall Castle, a pub boat on the river, where we mulled over our day with a warming mulled wine each. Finally, we caught one of the last boats returning East to Tower pier, braving the chilly November evening to enjoy our final ride up top on the open deck. The lights of London night slid by and we talked about our grand day in the big city as tourists. All that remained was to catch our train from French Urchin street eastward, back to Essex! As night falls, London lights up! Top tip: if you plan to make full use of the 24-hour river pass ticket, you could plan to visit in the warmer months. The boats operate for longer in high summer (July-Sept) with the last cruise running as late as 19:30 giving you much more sight-seeing boat time on the Thames! Make sure to check the timetables as times vary depending on time of year and which pier you are travelling from/to. I spotted a species I didn’t expect while out walking in the hills above Bath on our recent trip (see my postcard from Bath!). Natasha and I took the Skyline Tour on the sightseeing bus, alighting to walk to the Sham Castle and explore Bathampton Down. We walked part of the Bath Skyline walk – maintained by the National Trust this route circles Bath and provides fantastic views of the city. We also took a wander in Bathwick Wood (Woodland Trust) to enjoy the onset of Autumn. We were lucky enough to spot more than trees and great views on our walk however. Bathwick Wood, home to a new species? Is this a new species for Somerset? The Ewok is native to Endor, but this sighting may mean that the species’ range has spread to include woodland habitat in parts of Somerset. It remains to be seen if this was an isolated individual or if the species has naturalised here. Cryptozoologists would be very keen to hear about any other sightings of this elusive woodland creature. Ewoks are omnivorous and are usually found high up in trees (see Wookieepedia for more on the species). I really enjoyed visiting the beautiful city of Bath recently, so I’m sending you a postcard. Bath is a world heritage site with a lot of history. Which of its many sights and landmarks did I choose to feature on a postcard? Front Left: The Roman Baths, with Bath Abbey in the background. Bath was a spa settlement in Roman times due to the natural hot springs here. You can still bathe in these thermal spring waters if you visit the Thermae Spa – I’d highly recommend it! Front Right: The River Avon. We had brilliant views of the river and Bathampton Toll Bridge from the Old Mill Hotel. Canoe hire was available here so we took advantage on our last day and saw the river up close and personal! The weather was glorious and we saw a kingfisher, hooray! 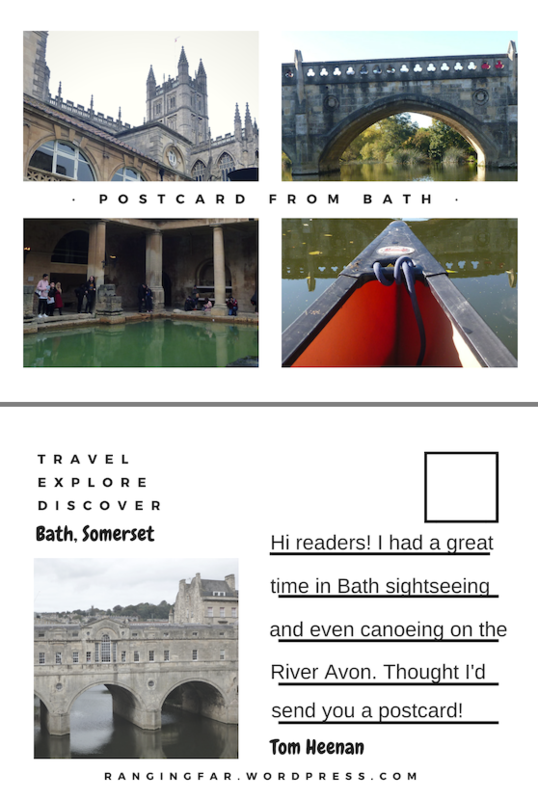 Now, as a gift for you – here is a free blank version of the postcard to download in case you want to send a postcard from Bath too! Yesterday I was treated to a birthday treat – some “Whodun’it Crime & Dine Entertainment” in the form of a muder mystery meal. This was a nice surpise, thanks Natasha! The murder mystery was enacted by Moneypenny Productions and took place at the Thurrock Hotel in Essex. Thurrock Hotel, Aveley, Essex. Scene of last night’s murder! We arrived at the hotel and grabbed a drink in the bar while waiting for the mysterious meal to begin… ‎We were called into the Belmont Suite where we had assigned tables. Natasha and I joined some friendly folks on Table 6. We were given some background info through flyers on the table, and we were introduced to the evening with spooky music and a delightfully over-the-top actor – “Victor Frunkelfurter”, the victim-to-be. The evening unfolded with food and fun as the victim and three suspects interacted, drip-fed us clues and gave us the chance to cross-examine them with our own questions. The mystery took place in 1835 in Edinburgh with a cast of eccentric individuals: Victor Frunkelfurter, fleeing debt; Gr’igor, a lady of many parts (work in progress); Berk, supplier of bodies to Edinburgh University‎’s medical students: Rabbit, cousin to Berk and owner of the Firkin Firkers inn. Tom attends the murder mystery meal with a ghost! The case of the invisible corpse… Who did it? Characters “act out” during our meal. I laughed over my tomato soup at the actors’ antics, deliberated through dinner over the clues and motives, and by dessert thought I’d detected the dastardly culprit. We scored well on points for questioning the suspects; enthusiastic Table 6 cheered themselves loudly at this point. All tables submitted their answers / best stab in the dark as to who, how and why the murder was committed. Sadly Table 6 was mistaken – and our table was ridiculed mercilessly for our earlier smugness! It was all extremely good fun though: good food, good entertainment and good company. I would definitely do something similar in the future! Moneypenny Productions produce live interactive murder mystery dinner theatre with hilarious consequences. We have been trading in the United Kingdom since 1996 and run on average 250 interactive murder mystery events each year. I was looking for something interesting to do with my younger sisters. I had invited them to come to stay with me and Natasha, and I wanted to make sure it would be a bit different – memorable even. With my interest in wildlife, I came up with some unusual ideas to keep two teenagers occupied… bees, anyone? Through my work as a Ranger I happen to know a beekeeper, so experience #1 was planned as a bee-keeping experience for all of us! Saturday morning rolled around, and the four of us headed up into the Langdon Hills on the southern edge of Basildon. Sam from Porch Honey met us and walked us up a steep hill to one of the meadows that make up Langdon Hills Country Park. Porch Honey operates holistic bee-farming on a number of sites, with hives on SSSI land (Site of Special Scientific Interest) at both Langdon Hills Country Park and Wat Tyler Country Park. As Kim later told me, “I think of this as my office”. As we walked into the field, the views opened up to the Thames and even the hills beyond. The sun drenched us, and there were wildflowers and pollinators to spot here even after the annual haycut had taken place. Kim met us there, and together with Sam explained a bit about honeybees, bee farming and their own ethical methods. This includes limiting their hives and honey extraction to maintain wild pollinators – great news for wild bees, butterflies and other wildlife. Happy World Ranger Day! To all the Rangers and others that work (and volunteer) to protect the world’s natural and cultural treasures, and to everyone else that values and respects the planet’s special animals, plants and landscapes. What Works in Conservation has been created to provide practitioners with answers to these and many other questions about practical conservation. This book provides an assessment of the effectiveness of 1277 conservation interventions based on summarized scientific evidence. The latest edition of this publication, “What Works in Conservation 2018”, has been released. This is available in paperback, hardbook and ebook formats – and as a free download in PDF format. Budgets can be very tight in the environmental sector, but with a free option there is no excuse not to take a look. We all tend to have our go-to courses of action, whether it’s something we’ve been taught or the standard way our organisation responds to a problem. Besides, how often do we feel like we have the time to consult a hefty volume like this at work when we are making decisions? Perhaps what we should be asking is: can we afford not to take the time to check how effective a strategy or intervention might be, before we devote time, effort, money and other resources to it? I’m going to challenge myself to delve a bit more into the evidence, and maybe weigh up some alternative strategies where the evidence warrants. Who wouldn’t want to be more effective with the same limited resources? “What Works in Conservation” deals with the scientific evidence base behind different conservation interventions, and there is still a large information gap in many areas where studies haven’t yet been carried out or the results of studies are inconclusive. Where evidence does exist however, either for or against a given intervention, it would be invaluable to have access to it neatly packaged in one publication. Why not head to Open Book Publishers to download What Works in Conservation 2018? A longer version of this article appeared in the July 2018 issue of the Countryside Management Association’s East of England regional newsletter. You can find out more about membership of the CMA on their website.